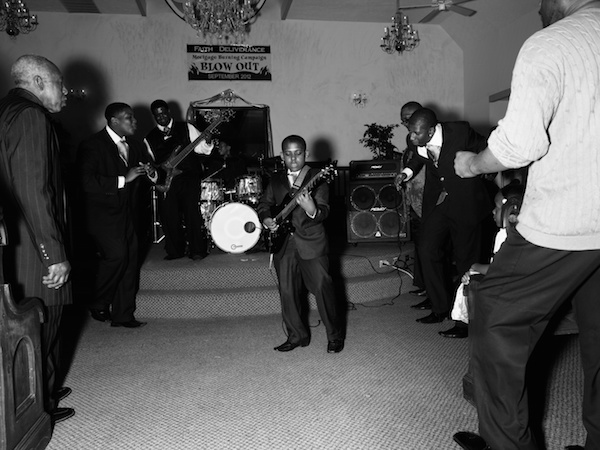 Alec Soth, Lil’ Jay J and the Spiritual Boys. Rochester, New York, 2015, black-and-white photograph, 30 x 40". MY LAST PROJECT, Broken Manual, was about the desire to disengage from society and run away from the world. After that, along with doing some magazine assignments and collaborations with other photographers, I started self-publishing a newspaper called The LBM Dispatch with the writer Brad Zellar. Songbook collects all of this work from the last few years, but the text has been removed. I actually found this process liberating. So much of editorial work is about making decisions in service of the story. In this case, I was relieved of that. From the thousands of pictures I had made over the past few years, I could untangle myself from the specific stories and just swim in the visual. It was a treat. Meanwhile, I started formulating what came to be Songbook. The book is a compilation of all of this quasi-journalistic work from the past three years. But unlike the Dispatches and other publications, the stories behind the pictures have been stripped away. My goal was to produce something lyrical rather than informational. I often reference the music industry when talking about publishing. Most music is now obtained for free via digital download. Nevertheless, there’s been a boom in more expensive vinyl records, and live performance is just as vital as ever. In a similar way, as photography has also become free online, there seems to have been a surge of interest in photography books and exhibitions. People have a craving for physical objects and experiences. Just as I make an analogy between the photographic and music, Songbook is like a vinyl record. It’s a physical object that you can hold, and the pictures, like songs, are sequenced in a certain way to achieve an effect. With most pop records, there’s always been an understanding that there will be singles, removed from the album and experienced in a number of different ways. What’s different in the digital age is that every song has become a kind of single. It’s only those die-hard connoisseurs who buy an album and listen to its originally intended sequence. This also holds true for photography, and Songbook is well suited to function in this universe. Broken Manual was like a concept album in that a lot of the pictures don’t make any sense outside of their original context. When you show photographs in a gallery, it’s often a struggle to try and translate the spirit of a book-length project onto the wall. But since so much of the emphasis of Songbook is on the lyrical power of decontextualized images rather than on the story, I found the curatorial process simpler. It was just a matter of doing more editing to carry the most impact in the space. The great thing about photography is that, like music, it translates into these various forms quite easily.